Keystone is throwing a Mardi Gras Party and you are invited! Come celebrate Mardi Gras in the Rockies with the entire family at Keystone Resort. Bring your beads, costumes, and of course your appetite to try all the delicious gumbo Keystone has to offer. 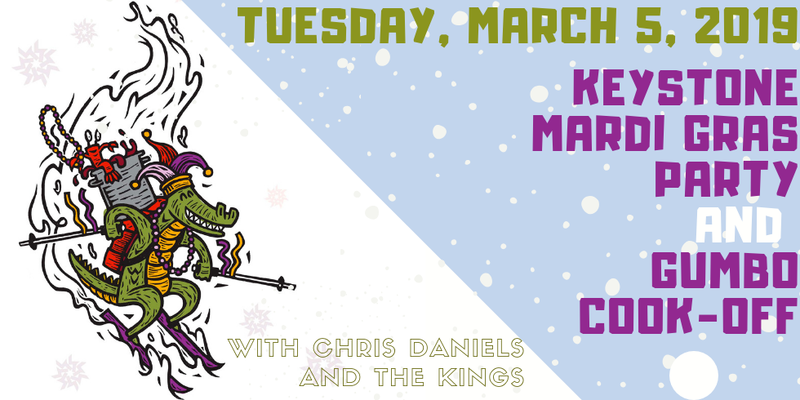 Get your taste buds ready and your dancing shoes on as you taste the best gumbo in Keystone while listening to free live music by Chris Daniels and the Kings. For adults, tickets are just $12 in advance, $15 at the gate and will get you unlimited tastes and once you have given them all a try be sure to cast your vote for People’s Choice! Want to bring the kids along? New this year, kid’s tickets are $5 in advance and $8 at the gate. Kid’s will get their own kids choice ticket for their favorite gumbo. See you at Keystone for a Mardi Gras Party you and the whole family will enjoy! If you are interested in putting a team together please contact Chelsea Rybak at 970-423-8994 or chelsea@keystoneneighbourhood.com. No entry fee required, participation is open to anyone who thinks their Gumbo can win! All participants will be provided with a tent, two tables, linens, tasting cups, spoons and napkins. 1st and 2nd Place will be awarded in the following categories: Seafood/Exotic, Chicken & Sausage. 1st and 2nd place in each of these categories will be awarded by the Judges Panel and People’s Choice will be determined by the guests. We will also be giving out a Team Spirit award this year. So be sure to deck your booth out and put on your best costume for the chance to win! Bracelet gets you unlimited tastings from all participants.